I want to say thank you for my amazing new leg piece. My sea dragon has been a plan in the works for a long time. When I finally was ready Rachel was the perfect choice. My vision and Rachel’s vision, skill and style blended so perfectly together! I’m getting tons of compliments and people wanting to know who did it! 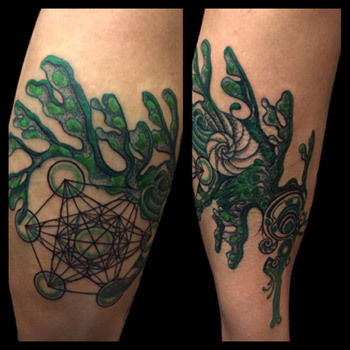 My first leg piece, I loved watching Rachel take my initial idea and transform it, adding what was sacred to me, taking the time at the light board, back and forth, tweaking, re-doing until we both agreed what was perfect!